We tied at 103. 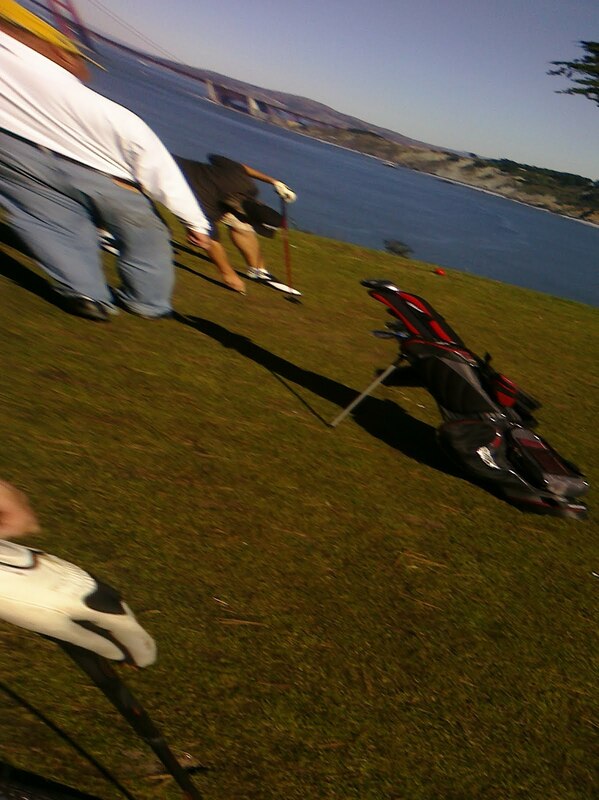 Bad golf on a good day. I won 10 skins. Roy won 8. He stiffed me on my $2 even though I bought lunch to settle the last bet. Sent from Roy's iPhone, as he could not figure out how to take a picture from my more sophisticated Palm pre. Is he cannot seem to master my Palm Prē camera. Looks good, but looks are deceiving. Roy sends me a text last night - "lets walk out at Lincoln at 8." No waiting. 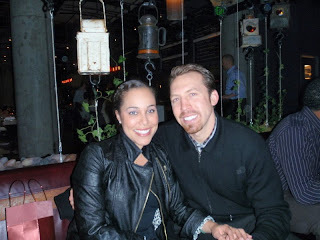 Marisa passed the bar! We are celebrating at RN 74. More pics later. 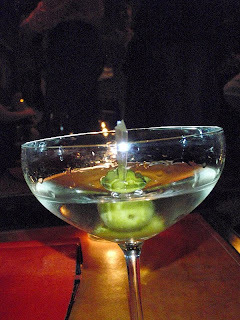 Hendricks, as they don't stock Boodles. Still good. 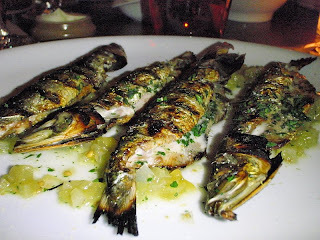 Monterey sardines for an appetizer. 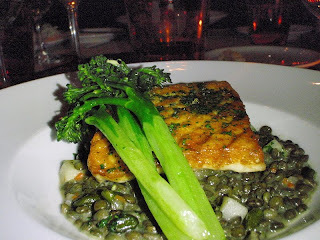 Grilled Sturgeon. Everything was excellent. 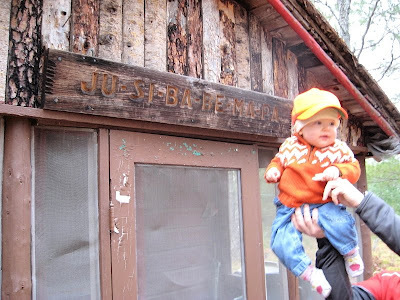 For the ceremonial opening of the first bottle of Escanaba Pail Ale (#19), Mike K, Emily, Matt and Olive made the pilgrimage to the place of the brew's birth - lil' camp on the the Escanaba River. The Chief Quality Officer was on hand to follow up the fruits of her handiwork. 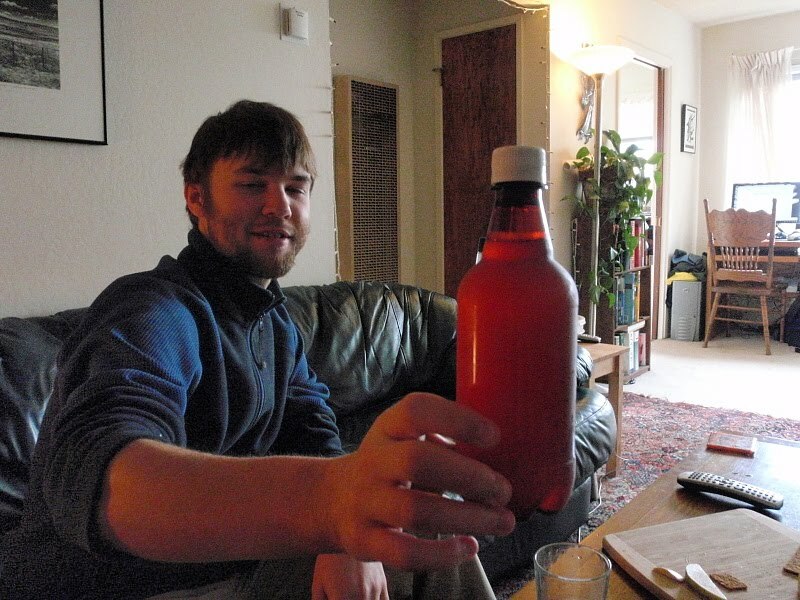 The first pour (confirmed by photo time-stamp). Clarity was sacrificied in the trek to the source. 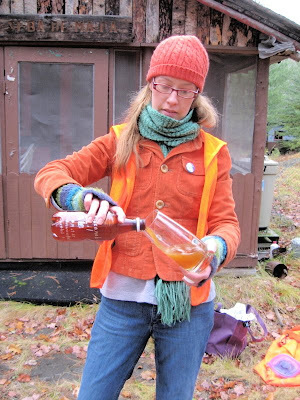 "The EPA tasting took place at the height of deer season. 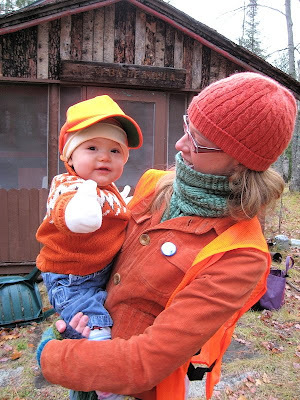 As we approached Lil Camp hunters in blaze orange littered the landscape like so many brightly colored plastic bags clinging to the underbrush. We all dressed accordingly. The brewmaster assembled an elite cadre of premier west coast beer connoisseurs for the auspicious event. The toast and first taste. The verdict: Delicious but not what we expected. In contrast to the report of #19 sampled at lil' camp, #5 had a weak thin head. Apparently variation in the quality of bottle seals will be found across this batch. In my refrigerator, the #7 bottle is soft and easily dimpled, #23 is solid and resists pressure. It's a crap shoot. Best of luck to all recipients. 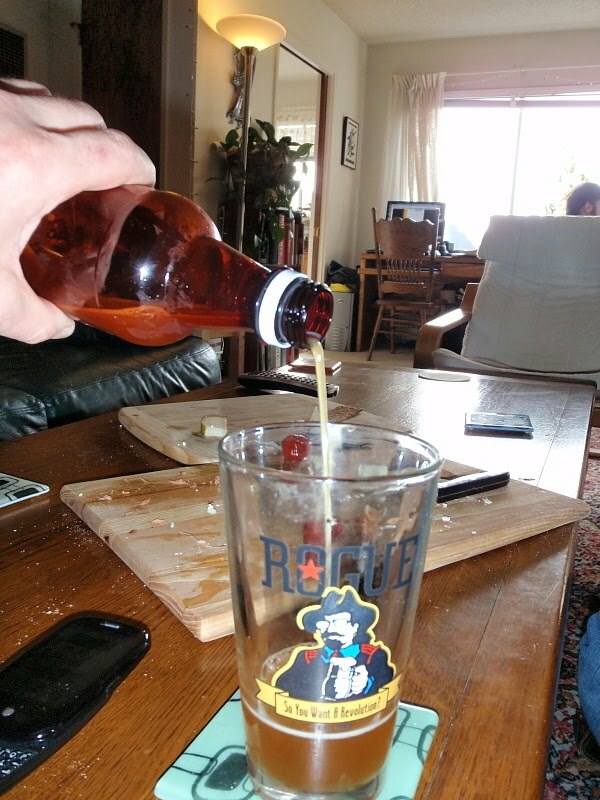 The ale glows with luminous honey amber warmth. It is an approachable, easy drinking, and - dare I say - affectionate ale. If judged by the expectations of a robust IPA, it will disappoint. The brew is, frankly, starved for hops. I blame HDW, whose insane non-stop e-mail rants about overhopped ales during the long pre-brew preparation process apparently intimidated our young and impressionable brewmaster. 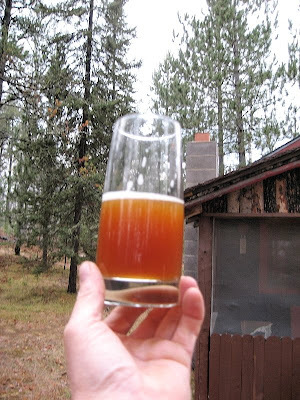 That said, if considered on its own merits and without prejudgment, this is a unique brew. 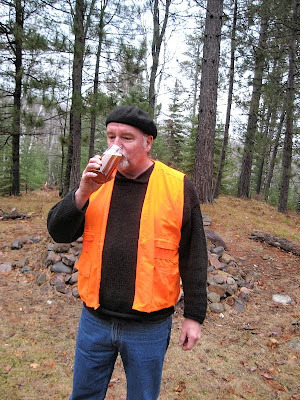 MK notes a similarity to Scottish Ale. I find the color and feel more reminiscent of a Belgian Ale, without the alcohol kick. 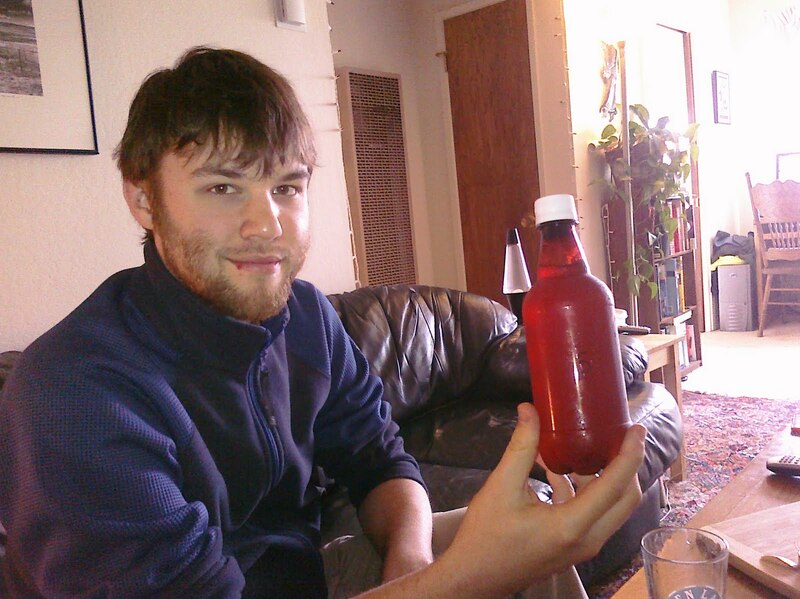 A geographical compromise puts this brew somewhere in the North Sea. But that is too cold for this confection. Welcoming and inviting, the malt provides a floor on which apple and anise dance a pas de deux across the palate. Subtle hints of yet to be recognized flavor notes echo faintly from the orchestra pit perhaps to emerge with aging in the second act. Just when you think the pleasant but unremarkable orchestration of flavors is fading away, a crescendo with the shimmer of steel leaves the drinker with a biting fatalistic aftertaste of rust that never sleeps. It is a lingering reminder of and returning us to the minerals buried in the ground through which the Escanaba River flows. ...will occur shortly. 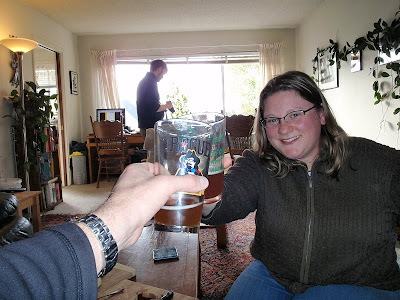 I am at Brewmaster Sean and Katie's place for the first sip. 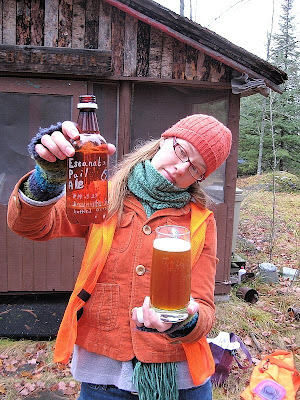 Brewed in October, the E.P.A. has been deemed ready to drink. 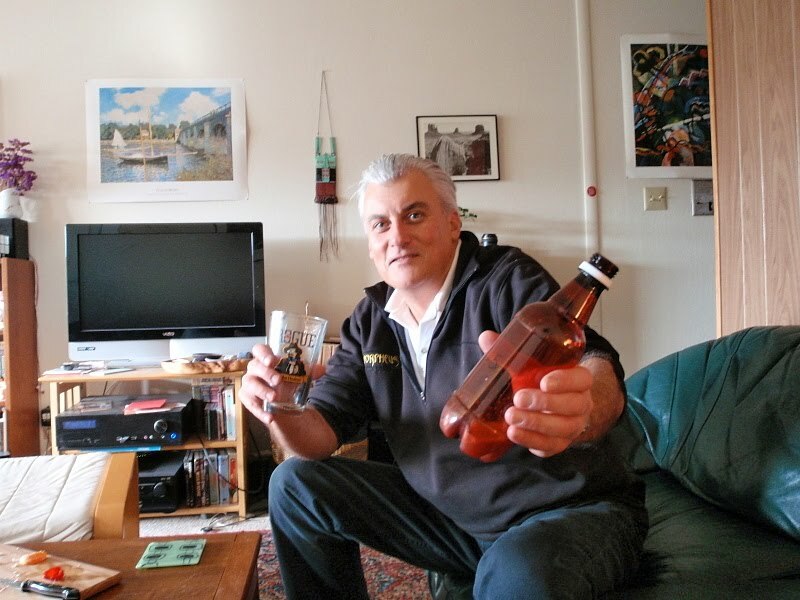 Mike K. and crew are theoretically at little camp for a simultaneous tasting at the birthplace of the brew. More pics from SF and the Escanaba river later along with tasting notes. 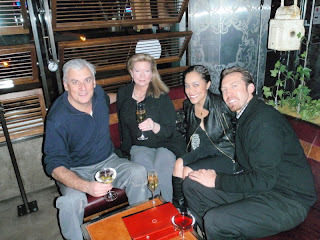 A clip of the first pour and first taste in SF. 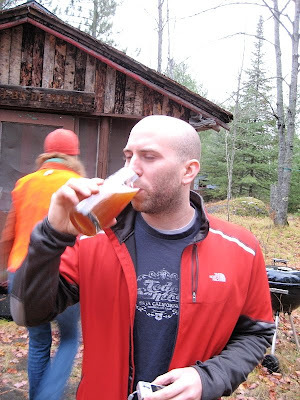 We have decided to delay posting our initial tasting impressions, until we hear from the U.P. crew. They are easily impressionable and we do not want to unduly influence their reviews. 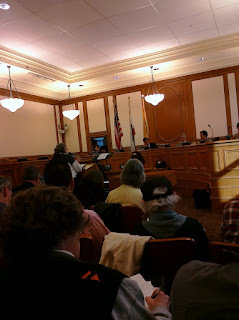 Reviewing the last few posts, I note that my "live blog" effort at the San Francisco Recreation and Parks Commission meeting was - what's the word? - lame. Let's supplement with some MSM coverage. 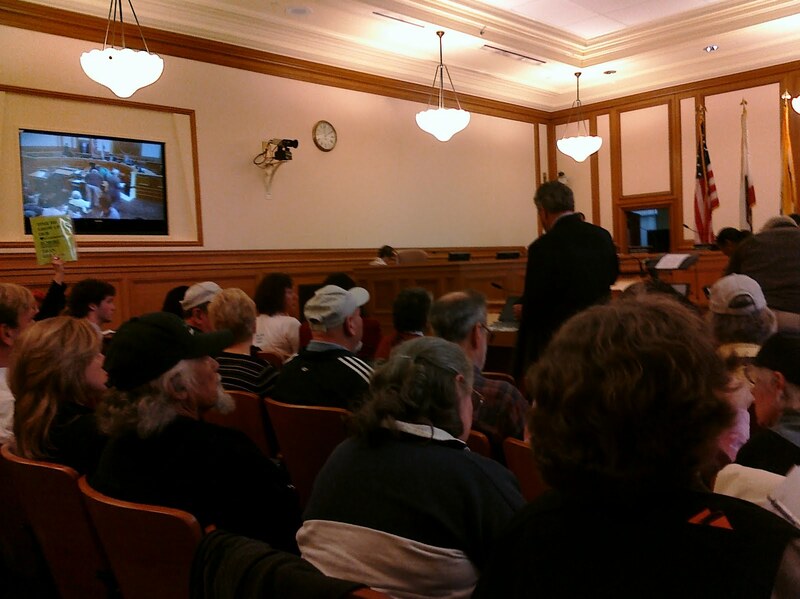 "The future of San Francisco's Sharp Park Golf Course, which is located in Pacifica, drew dozens of people to City Hall Thursday for a hearing before the Recreation and Park Commission. 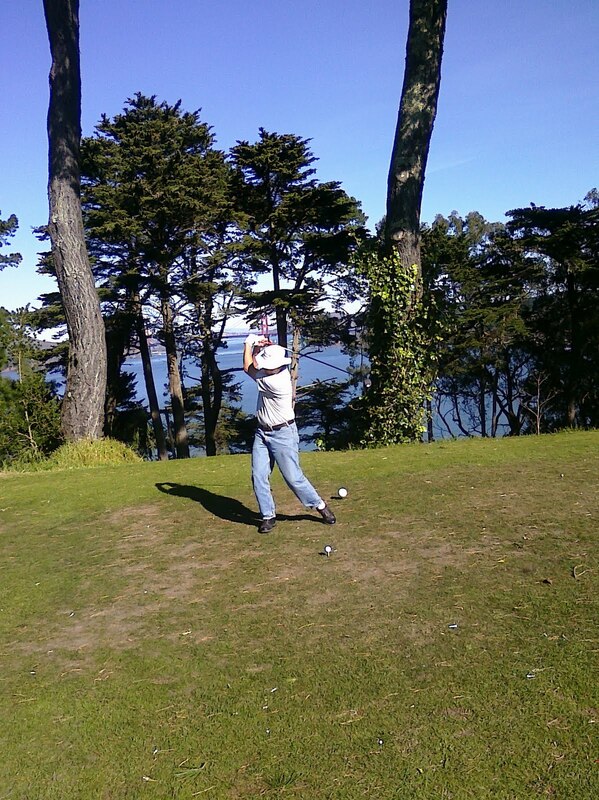 The 18-hole coastside course is home to the federally protected San Francisco garter snake, an endangered species. Some environmental activists want the city to close the public links and convert the property to a more natural state. 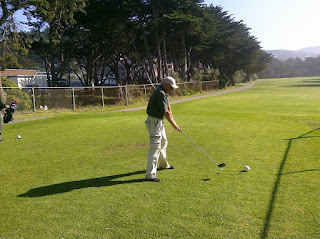 Golfers and many nearby residents want to keep the popular course open." Hmmm. The MSM coverage is not much better than my live-blog efforts. They barely scratch the surface, focusing on the fact that there is a debate (duh), as opposed to making any sort of journalistic effort to look at the source of the debate, the facts of the debate, and how the debate has evolved. Both ABC and the Chronicle get the participants of the debate wrong, although the error is understandable. They have to present the antagonists in the simplest, most easily digestible form for the audience - Golfers vs. Environmentalists. In fact, if you look in detail at the issues in dispute, the debate is more accurately portrayed as Environmentalists vs. Environmentalists. Golfers are siding with those environmentalists that prioritize creating habitat for the snake over those environmentalists favoring restoring the original salt water lagoon that existed before the the golf course. This issue was highlighted by the comments of Karen Swaim, an environmentalist and biologist who has done extensive work with the San Francisco garter snake. At the end of the night (presumably after the MSM deadline) she ripped the opposing environmentalists a new one, specifically those who were conflating the contradictory goals of coastal wetland restoration (i.e. CBD and Plater) with enhancing and expanding garter snake habitat on this site. More on this schism in a future post. Watching the ABC clip you might get the impression that the primary reason that the Plater/CBD environmentalist camp were arguing for the destruction of the golf course, was to protect the snake and frog against global warming and the rise in sea levels. Brent Plater is featured in the video saying "The area that currently is designated for endangered species habitat at Sharp Park, is the area that is going to be overrun by climate change and sea-level rise." In fact, this is a new argument for the Plater/CBD environmentalist faction, a new "mole" that only recently popped out its hidey hole. Hence the title of this post. Trying to have a reasoned discussion with these guys is like playing a game of whack-a-mole. Example: The Rec and Parks report definitively whacked the "golf operations are killing endangered species" mole. So now we see a new "global warming/rising seas will kill the endangered species at Sharp Park" mole pop out of the hole. It does not matter that it is completely nonsensical. Once people realize how truly absurd this meme is - "We have to destroy the course NOW to protect the snake from a catastrophe that, if it happens, will destroy all of Pacifica, Outer Sunset, Golden Gate Park, Alameda, the Marina, SFO, etc. etc. in 75 years or so." - then another mole will pop up. Apparently the point of their arguments do not require them to make sense, the point is not to make reasoned arguments at all, the point is simply to distract attention from the previously whacked mole. It is instructive to go back to the original reason this mess was stirred up - the September, 2008 letter from the Center for Biological Diversity threatening to sue The City. "SFRPD … must cease all other management activities at Sharp Park that harm California red-legged frogs and San Francisco garter snakes (e.g., mowing, yard maintenance, sediment deposition, nutrient runoff); and must develop a plan that will prevent future and harmful activities in Sharp Park to frogs and garter snakes." Note what is not in the letter - any mention of global warming/climate change/rising sea levels. In an earlier incarnation, Plater's stump speech did not mention climate change or sea rise. In the SJ Mercury version, it was an afterthought tossed in at the end. Then something happened on November 6, 2009. 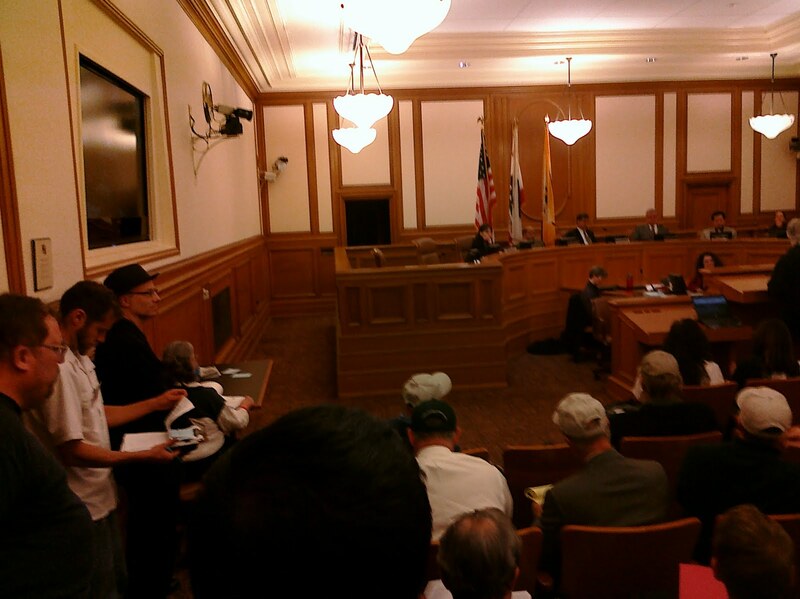 The San Francisco Department of Recreation and Parks released the long awaited report developed specifically to address the issues raised by the CBD in their threat to sue. 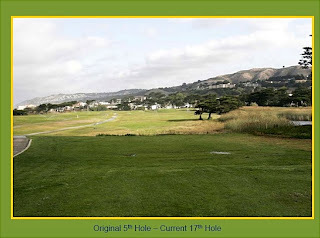 The report recommended keeping and modifying the 18 hole course and was embraced by Operations Manager Phil Ginsberg, environmentalists who prioritize creating immediate beneficial habitat for the San Francisco garter snake, as well as local, state, and federal politicians from across the bay area. The report clearly addresses all issues of "golf operations" affecting the snake and frog population. So how do the Plater/CBD faction react? They turn the page of the hymnbook and start singing a new song. “...the minimal habitat enhancement proposed by the Park Department in the 18-hole alternative is inadequate to allow the recovery of the garter snake and frog at the site, and is set up to fail with climate change and sea level rise... If we don't create defensible space upland of Laguna Salada for the snake and frog, which right now is all golf course, we will lose that population forever." This can only be explained as a deliberate and conscious campaign of obfuscation. It is trial lawyer trickery. When the the new mole pops up out of the hole (Destroy the course to protect the snake from global warming and the sea! 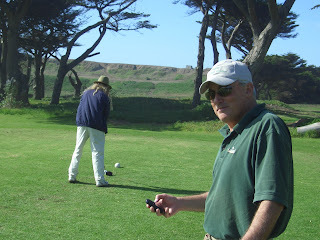 ), attention is distracted from the last smashed mole (Destroy the course to protect the snake from golf operations!). This can go on indefinitely. There is always another mole. "You know, the issue of climate change is a serious one, and one we all have to concerned about. But in 50 to 100 years, San Francisco International Airport may be under water. So I think what we have to do now is be practical about protecting the garter snake and the red-legged frog and keeping the golf course open." Spot on. Couldn't have said it better myself. Brent - consider that mole whacked. Time for a new mole to pop up. Got my 2 cents in, they gave me a few second over the one minute. I may get the clip off of SFGTV someday. After 4 hours I am out of here. Barb A. Is the first up after Supervisor Mirkarimi's representative. I think it is telling the Mirkarimi did not personally show his face at the hearing. Barb makes some great points that Sharp usage is growing and the course is making money for The City, contrary to the assertions of those who would destroy the course. Her comments echo and expand on the finding of Nancy Wuerfel's report of The City's Golf Fund accounting. Nancy herself reinforced that idea later in her own public comment. 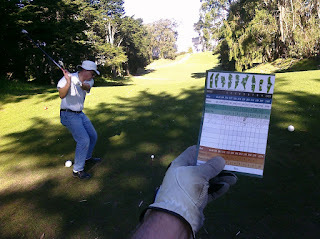 The economic and accounting ignorance of the Sharp Park Golf opponents is appalling. They cannot seem to understand the concept that if you must invoke "overhead charges" that are siphoned to other SFRPD or City entities in order to claim that course is losing money, it means the course is actually subsidizing City operations, and not the opposite. If you kill the course revenues paying for that non-golf "overhead", the overhead will still have to be paid from elsewhere, in either cuts or increased taxes. It is not rocket science, but it may be willful ignorance on the part of Plater and the CBD. Author Bo links was at the podium shortly after. 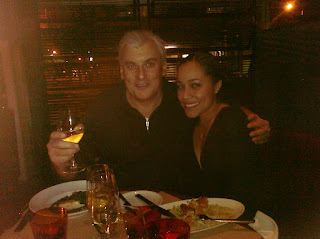 I cornered him later to sign my copy of "Follow The Wind". Great book. As submitted to the commission. Reviewing recommended modifications to the course to protect the frog and snake, and be in compliance with the ESA. 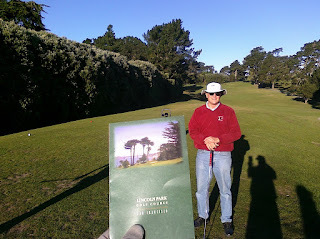 ...which is up for renewal to manage Harding Park. She thinks it should be put out for bid. We are still in general session. Sharp Park commentary has not yet begun. 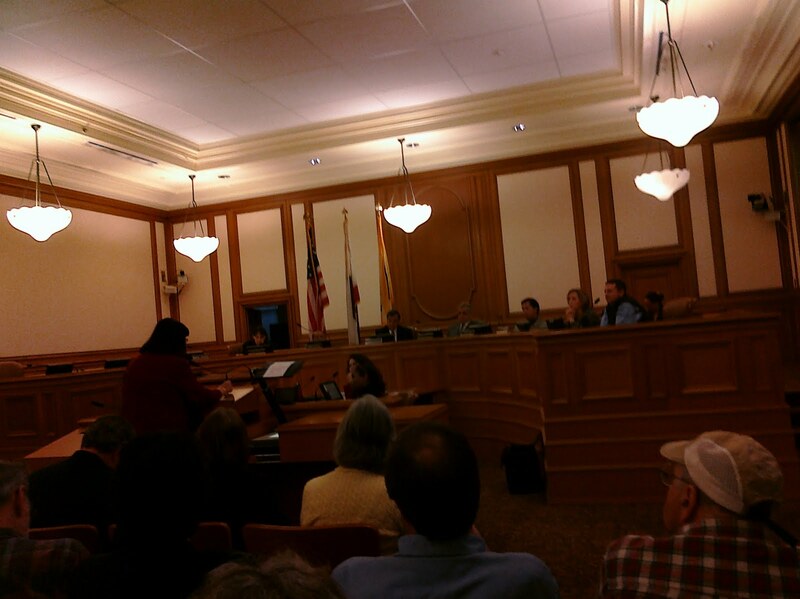 I was pleased to meet Nancy at the meeting, and told her how impressed and appreciative I was of her work lifting the veil on Sharp Park Golf finances. She represents the best in the great American tradition of a political gadfly. She keeps them honest. I am in room 416 of City Hall waiting for the discussion of the Sharp Park Golf course report. Looks like about 50-50 supporters and detractors. Not sure how well this will work out, but will try to get a few pics and posts out. They have already announced that public comment will be limited to one minute each due to the number of people here. Center for Biological Diversity throws a hissy fit. 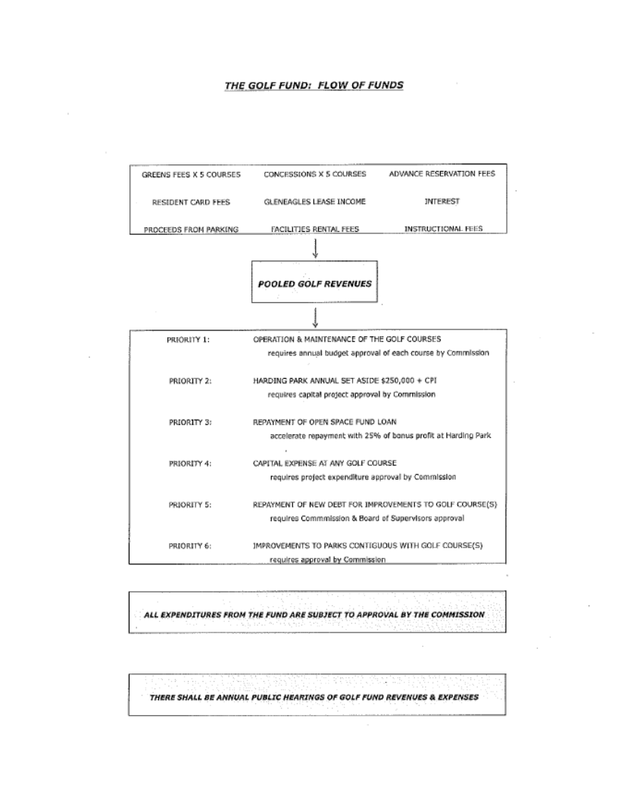 "a deeply flawed and incomplete alternatives report"
"omission of any credible discussion"
"deliberate attempts to constrain the scope of the report"
"incapable of any objective analysis"
"The report is extremely unprofessional"
"a complete and willful misunderstanding"
"inexcusable misunderstanding of and unfamiliarity"
It goes on and on, but you get the idea. To be fair, argumentum ad hominem is not the only logical fallacy employed in the press release. When they are not name calling, they rely extensively on argumentum ad verecundiam, specifically appealing to the authority of - you know - themselves and the "usual suspects" of a handful of scientists closely associated with the CBD. This is not surprising. CBD is a environmental litigation house, not an ecological research center. Their "science" is in the service of their lawsuits, and not vice versa. In general, CBD scientists are the equivalent of paid expert witnesses and CBD arguments are primarily courtroom tactics. This is not to say the perspective of the CBD scientists should be discounted simply because of their historically close ties and/or employment/contracting association with CBD. To the extent they are scientific arguments and not legal arguments, they will stand or fall on their own merit. However, given the close association with CBD, it is perfectly reasonable to look at their pronouncements with the same skepticism as those of - say - an Exxon scientist explaining why it is now safe to drill off the California coast. tan·trum (tntrm) n. A fit of bad temper. a childish fit of rage; Also called regionally hissy, hissy fit. "Causes [of tantrums] include frustration, tiredness, and hunger. Children also may have temper tantrums to seek attention, obtain something, or avoid doing something." Now it makes sense. 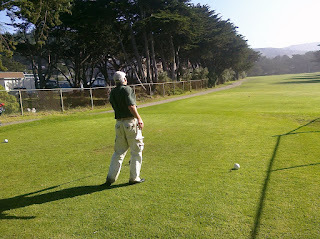 Things are not going well for the CBD pet project, Restore Sharp Park Destroy Sharp Park Golf. In recent weeks the Chronicle has come out in support of the golf course, as has columnist C.W. Nevius. Nancy Wuerfel wrote a scathing report and Op Ed undermining the CBD contention that the course loses money for The City. It doesn't. 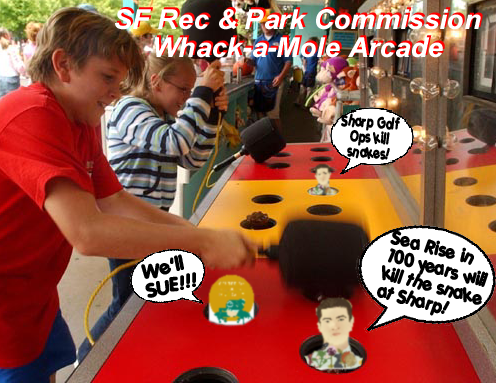 Finally the SF Department of Rec and Parks released the report recommending continuing the 18 hole course that triggered the CBD tantrum. Congresswoman Jackie Speir has since weighed in supporting the report and the golf course. CBD is frustrated and is realizing they may not get what they want - the destruction of the course. Congresswoman Jackie Speir's support is particularly telling. Good politicians have a finely tuned sense of the political winds, In addition to Speir, Supervisor Sean Elsbernd, Pacifica Mayor Julie Lancelle, State Assembly Whip Fiona Ma, Assemblyman Jerry Hill, San Mateo County Supervisors Carole Groom and Adrienne Tissier, Pacifica councilmembers Vreeland and Nihart, and San Francisco City Attorney Dennis Herrera have come out in support of the Sharp Park Golf course. 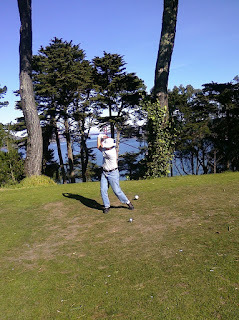 Many also attended the recent Save Sharp Park Golf fundraiser on Oct 22. I also attended the "Save Sharp Park" fundraiser, and it was an eye opener. 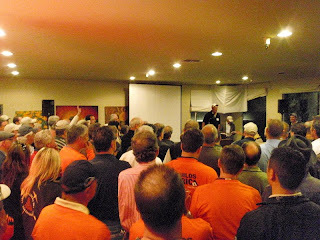 The room was packed shoulder to shoulder with young and old, men and women, Pacificans and San Franciscans, golfer and non-golfers, all in all a very diverse group that included a strong showing by San Francisco and Pacifica members of Local 261 Laborers Union. I was proud to be there with this group. 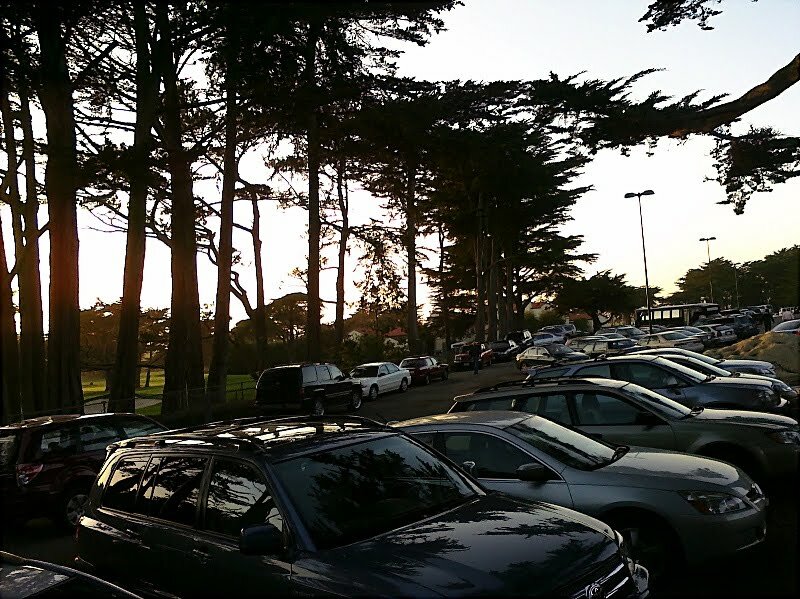 "From observing the fervor of Thurday night's crowd, the effort to help save Sharp Park Golf Course appears to be catching on substantially. The phrase, "Save Sharp Park Golf Course! ", could be heard on everybody's lips as one walked through the crowd... A quick scan of the audience looked like a page from "Who's Who" in both San Mateo and San Francisco Counties political circles. Standing in the front of the room off to the side was Supervisor Sean Elsbernd from San Francisco (One of the most important Supervisors in San Francisco, if not the most important, as far as the golf course issue is concerned) He was in deep conversation with the City Attorney of San Francisco, Dennis Herrera, who is rumored to be running for Mayor of SF next year. Both gave very strong speeches. In the same location in the front of the crowd could be seen San Mateo County Supervisor Carol Groome from San Mateo County's 2nd District, Don Horsley, San Mateo County Supervisorial candidate for the 3rd Supervisorial District seat, Joe Galligan, San Mateo County Treasurer Candidate, Mark Hershman, District Director for Assemblyman Jerry Hill of the 19th Assembly District, along with a number of Administrative Supervisorial staff from both San Mateo County and San Francisco County, in attendance." I arrived at sunset, and spent a few minutes jealously watching some golfers finish their round. What a beautiful course. A long way from the clubhouse, and the parking lot was packed. 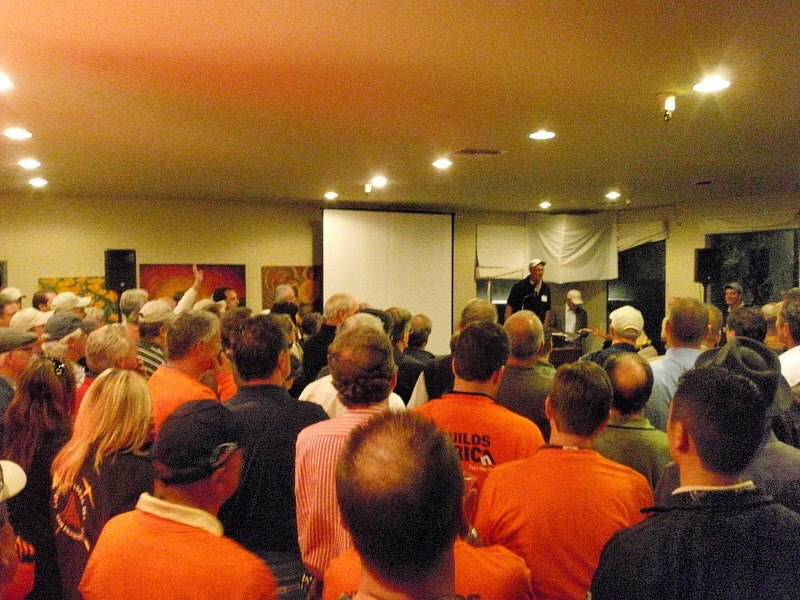 The room was SRO, with the enthusiastic orange shirted members of local 261 swelling the ranks. "Ignoring the tantrums and helping a young child learn how to deal with anger and frustration are often good ways to deal with tantrums. Pay attention to what starts the tantrums... you may need to use a technique called time-out. A time-out takes the child out of the situation and gives him or her time to calm down. It also teaches the child that having a temper tantrum is not acceptable behavior. " I'm afraid that ignoring CBD has not been effective so far, and although they need a "time out" I don't think it'll stop them from acting out. They are going to lose this battle and then they are going to sue. I say - bring it on. We have a lot of problems in The City, but a shortage of great lawyers is not one of them. No court is going close a 77 year old landmark historical course that is working in good faith to protect wildlife. A good spanking in court might teach CBD a little manners. 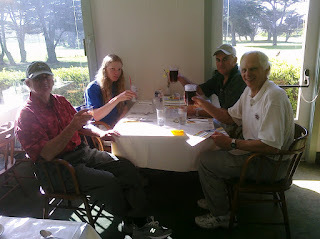 It also may give some of their contributors pause.They should ask themselves if there is not a better use of their environmental donations than funding a jihad against a public, affordable, historically important landmark golf course enjoyed by thousands of Bay area blue collar working stiffs, students, and retirees from all walks of life. 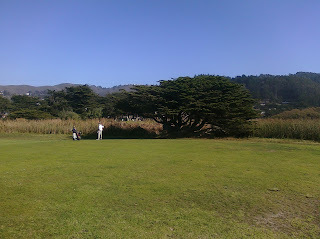 Sharp Park vista from the 16th tee, looking toward the 17th fairway - originally Alister MacKenzie's 5th hole. Photographed from a recent round at the course. A lot has happened on the Sharp Park front of the San Francisco Golf Wars since your loyal blogger last contributed his two cents with two posts in August: Common Sense and the Sharp Park Golf Course and Dispatches from the Sharp Park front of the SF Golf Wars. Things are coming to a head with the recent release of the long-awaited SF Rec and Parks Department Report and a scheduled SF Rec and Parks Commission meeting to vote on the report (This Thursday 11/18 at 2pm Room 416 at SF City Hall - hat tip - Fix Pacifica Blog). I'll be there. 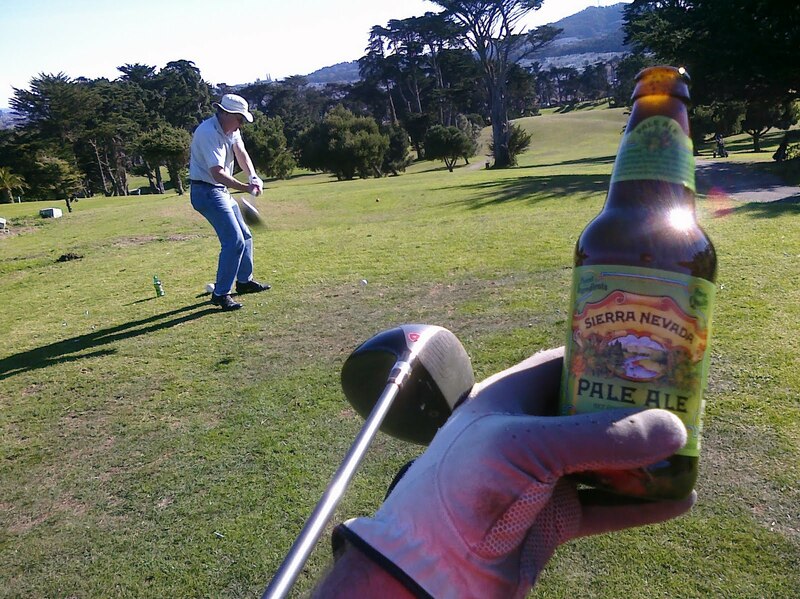 If you care about Sharp Park Golf, you will be too. The report recommends that Sharp Park continue as an 18 hole golf course, but be modified to further protect the frog and snake habitat. This has stirred up a lot of media coverage and I'll have more to say about recent twists and turns in this saga. But first, we need to catch up on a few of the significant skirmishes over the last couple months. "The course and the endangered frogs and snakes have co-existed for years. Sensitive management practices will allow golf (or other recreational uses) to continue while also supporting these rare species. Other cities manage to do both. We can, too. Claims that city golf courses lose money are just not true. I analyzed the financial information for the first six years of the city's Golf Fund. The Recreation and Park Department's accounting practices have created the appearance that Sharp Park golf course is losing money when it is not. These findings were submitted to the Recreation and Park Commission and the Recreation and Park Department." For good measure, Nancy also noted that the region is losing federal funds and jobs for the potential "Pipeline to Nowhere" as a direct consequence of The City's lack of support for the golf course. If Supervisor Mirkarimi gets his way and The City divests itself of the course and park, the stimulus money and the jobs for this shovel ready project will be lost. 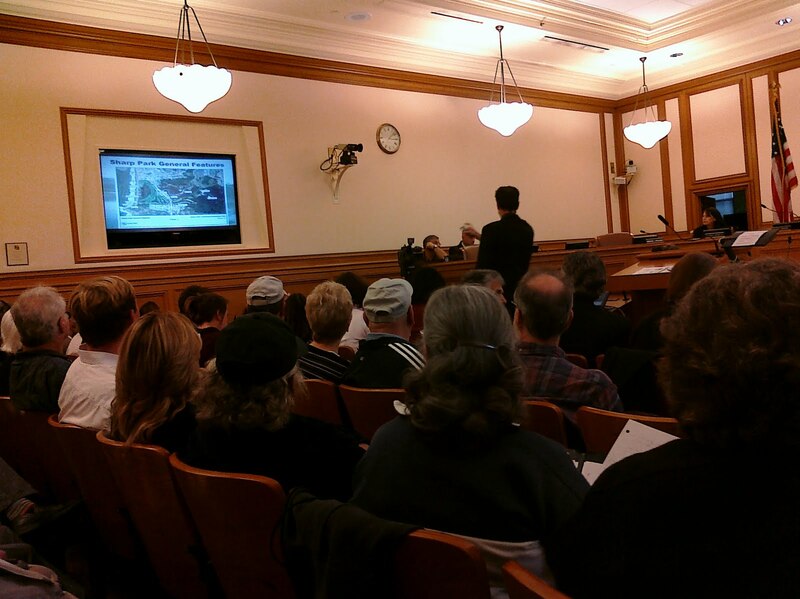 "If the city hands over control of the property to the Golden Gate National Recreation Area, the San Francisco PUC's project to bring recycled water to Pacifica will be jeopardized. 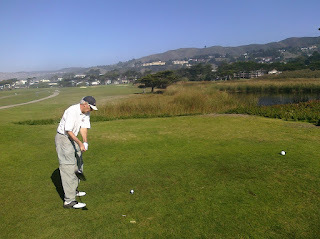 The Sharp Park golf course is critical to the project because it would use 80 percent of the water. Without this "ready customer" for the water, the project is on hold. Also on hold - and at risk of being lost - is $2.2 million in federal stimulus money already secured to build the recycled water infrastructure." 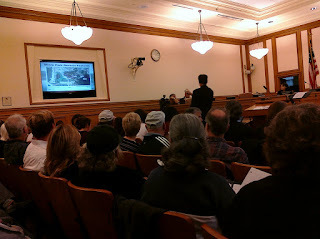 Until reading this essay, I was not aware that the project was on hold pending the decision of the Board of Supervisors. As far as I can tell, your loyal blogger was the first to highlight that specific issue - here, here and here. Just goes to show, even a lightly trafficked blog like this can serve to get the right idea in the right hands, for a right result. I have nothing against this project, but it is a foolish waste of money if the Board of Supervisors supports Mirkarimi's foolish proposal. "This report began as an examination of the accounting of the Golf Fund (Fund) to answer the question: "Does the Golf Fund make or lose money?" The short answer is that the Fund does pay its operating expenses (without General Fund subsidy) when Golf Fund Ordinance guidelines are followed." "...the question of whether or not the land currently occupied by golf courses should continue as golf courses or be converted to another use is a policy issue and is not addressed in this report. However, those decisions should be based on good, accurate accounting of the real expenses and revenues generated by the courses. RPD's current accounting practices do not provide policy makers with the information they need to make these decisions. Accountability for funds and transparency of their uses are missing from RPD’s handling of the Golf Fund. Mischaracterizing expenses as Operating costs when they are actually Capital costs is wrong. That a vendor’s invoice was appropriate to be paid is NOT the issue. That the payment of building cost overruns was hidden as an expense of running the golf courses IS the issue. That there is a flawed mechanism in our City government that allowed this to happen IS the issue. That no one is watching over the agreements with the public IS the issue." "The golf revenue was understated due to internal practices that allowed operating expenses to be paid off the top. When this bad accounting is corrected, it is evident that revenue has been sufficient every year to pay the first priority costs of golf operations and maintenance. 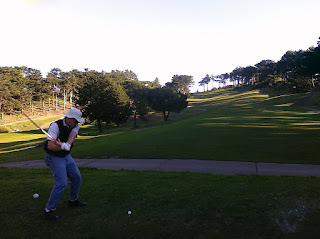 The bad accounting has been used to promote Prop J privatization of the golf courses and, potentially, the give away of Sharp Park to the federal government. When this bad accounting is corrected, different questions emerge as to why these actions are even considered." "RPD created a golf finance problem by inaccurate accounting and by not properly implementing the Golf Fund and other City Ordinances. These management issues are correctable. 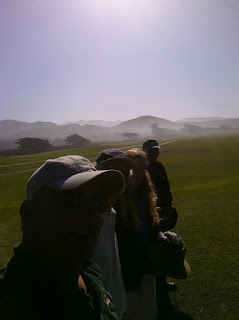 Rather than allow the Department to pursue solving this golf problem by giving away public lands to long- term lessees to manage, I wish to propose an alternative approach in which RPD retains operational control of the municipal courses but runs golf like a business with responsible revenue and cost management within the Department, as was always the intention. The model for this is the City of San Diego. Their municipal Golf Operations Division, which includes the much acclaimed Torrey Pines Golf Courses, has an organizational structure and 5 year business plan that provide a compelling model to consider for San Francisco’s municipal golfcourses. There are a number of similarities between San Diego and San Francisco: the same number of golf holes, the responsibilities of championship events, similar operational requirements, public concerns, and financing issues. It's main virtue is its structure - it has one — with a Golf Operations Manager in charge. 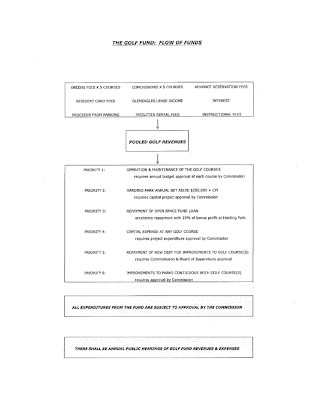 This model V was referenced in both the ERA report in 2002 and described in detail in the NGF report in 2007 (Appendix, pages 56-64-). lt is not clear why RPD did not choose to include this model in their list of possibilities for San Francisco. 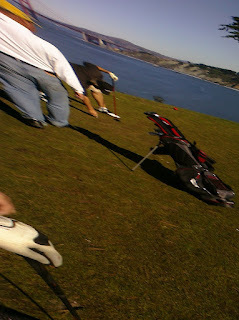 San Francisco should be at least as capable as San Diego is at running a first-rate municipal golf course!" "It is time to call for an independent, third party, cash operations audit, the scope of which is to a high standard of "a comprehensive engagement beyond the level of sampling." "The advocates of destroying or giving away the course place enormous weight on the representation that the course is losing money. The recent exhaustive letter/report from Nancy Wuerfel to The City indicates that this representation is completely false. Obviously it would be terrible mistake for the city to make a decision to destroy or give away the course if it is in fact operationally revenue positive as Nancy represents. I think everyone can agree that this question of fact should be absolutely settled by an impartial and unimpeachable third party before a decision is rendered." We'll see if David does his required reading. 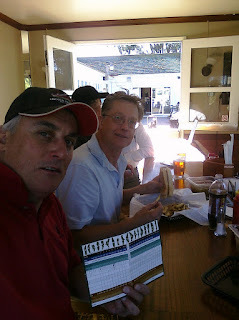 Brent Plater and the rest of his "Center for Biological Diversity" cohorts disingenuously continue to parrot provably false and dated data on the revenue positive contribution of Sharp Park golf. Honest to god, they sound like Birthers still claiming that Obama was born in Kenya despite all evidence to the contrary. The clear evidence from Nancy's report is that the course does make money for The City. 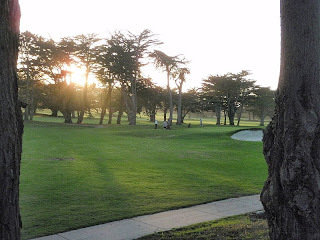 If the course was dragged out of the impenetrable SF accounting fog into a regional responsibility or even just a shared responsibility with Pacifica, everyone would understand that Sharp Park is a moneymaker. 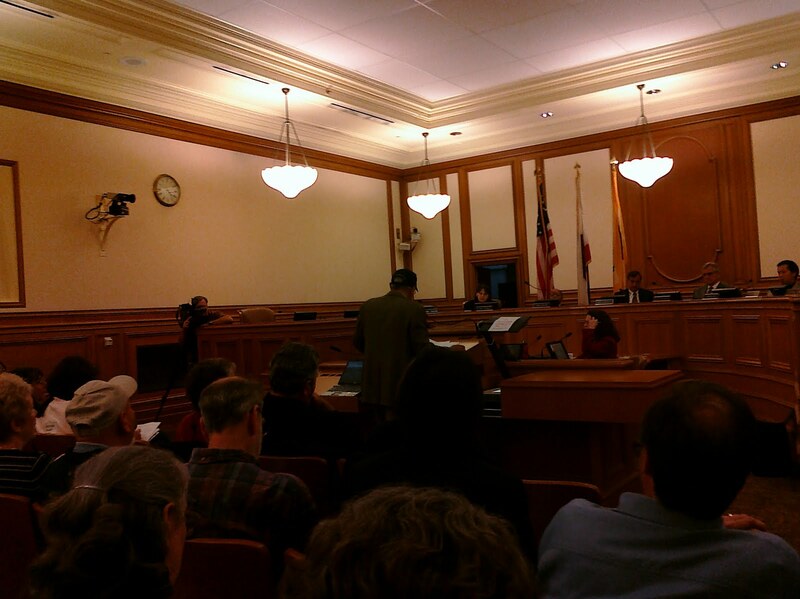 If and when that happens, Ross Mirkarimi is going to look like a complete idiot for falling under the influence of the Plater reality distortion field and advocating that this treasure of a course pass from city hands. That said, Nancy shows the level of incompetence is so deep, so widespread, required so much dereliction of duty and willful ignorance by so many public and elected officials of their public commitments and obligations under the law in order to maintain the fiction that the golf courses lose money, that you just have to wonder about motivation. If not incompetence, a real interesting and unresolved question remains - Who benefits from years of cooking the books to pretend that our money making golf courses are losing money? I return to my usual form for the back nine. I won nine skins (eight of them on the front), Bob won 5, Rick won 4. Adam wouldn't accept his Dad's handicap assignment and declined to participate. I don't think a follow through is supposed to look like this. 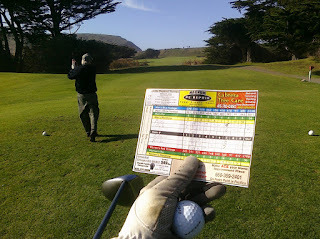 This image of the 17th hole from Bo Links educational powerpoint of the landmark Mackenzie course. ...where he joins Zwick The Younger on an eco-tour at the edge of a frog habitat. Vista from the 16th tee, looking toward the 17th fairway (originally Alister MacKenzie's 5th hole). Walking a beautiful historic course like this is one of the reasons to play golf. The residents of San Francisco and Pacific are lucky to have this treasure. As it turns out, I prefer to play the 17th fairway from the 16th tee and vice-versa. Your loyal blogger in action. 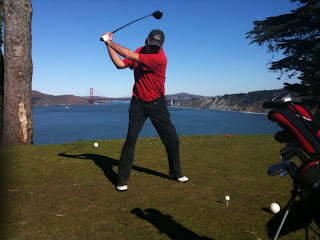 Hat tip to playing partner Rick for these pics. A new tradition on a beautiful hole.